SkypeURLCollector – An easy way to collect information from Skype chats and send to Twitter. I have up until now been using my VCP 4 copy of Workstation 7.0 for all my VM and vSphere Lab purposes. It has been great, and has allowed me to do a lot more testing / prototyping. Workstation 8.0 was recently released, so I decided to grab the evaluation version to play around with. My first impression: “Wow!” There are tons of new features available, as well as a nice newly redesigned UI. I’ll detail the features that mean the most to me to start with, and then walkthrough a very handy feature of VMware Workstation 8.0 – importing VMs from your local Workstation into a vCenter environment! First off, the main pull of Workstation 8 for me was the ability to virtualise Intel VT-x/EPT or AMD-V/RVI. When enabled, this passes through these special CPU feature sets into your VMs, which for ESXi / vSphere labs, means you can now run nested x64 virtual machines. Previously with Workstation 7.0 I was limited to only being able to power up 32 bit VMs in my virtualised vSphere lab environment. 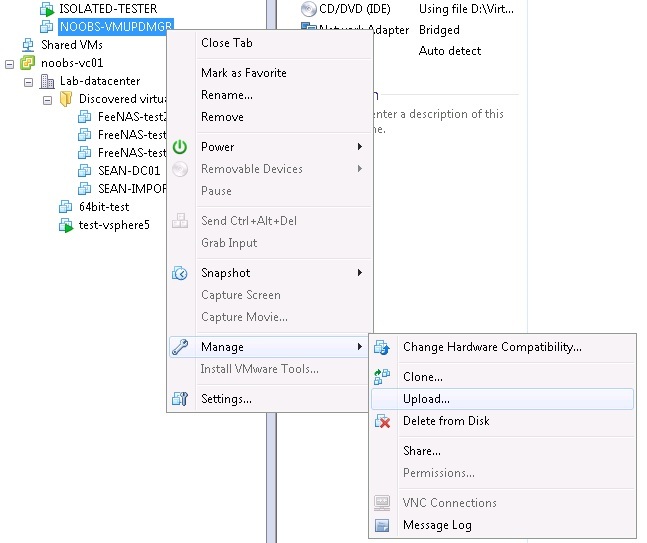 Enabling this option for virtualised ESXi 4.1 or 5.0 hosts now allows me to power up 64 bit VMs, which is great! Awesome feature in my opinion. In the past I would have used something like VMware Converter to convert a Workstation VM into a vSphere compatible VM and then upload it to vCenter. Now it is a simple case of drag and drop, or a couple of menu clicks once you have added your vCenter server as a node in Workstation. This is something I have been waiting for from VMware, not the typical kind of thing I would usually look at for business purposes (unless I was doing CAD or 3D modelling), but I am an avid gamer, so this is of great interest to me. I’ll definitely be testing running a couple of my games inside a VM to try this out. 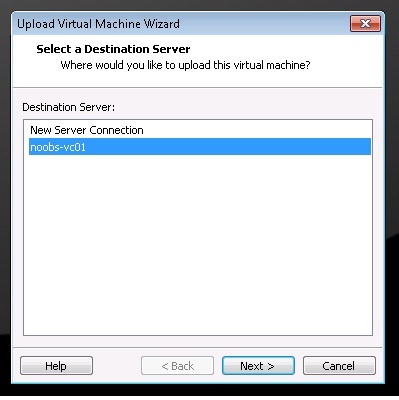 Uploading a Virtual Machine running on your local machine running in Workstation 8.0 to your vCenter server or ESX / ESXi host is really simple – either a drag and drop affair, or you can right click the machine you need to move and choose to upload it somewhere else. Here’s a quick rundown on how to do this. 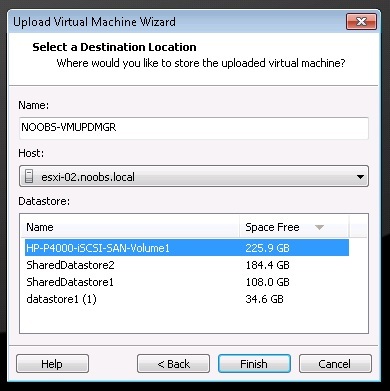 Select your vCenter server connection, specify a folder or location to place the VM, choose a shared Datastore to store the VM on, and then finish the wizard. Your VM should begin to upload to vCenter! If you hit any problems, check the permissions of the account you connected to vCenter with, as well as DNS – if your local workstation does not resolve the FQDN of your vCenter server or ESXi hosts correctly it will give you an error. 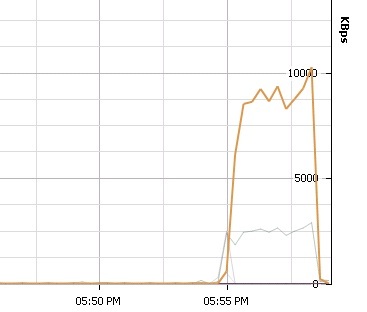 Out of interest, here is the spike in Write traffic to my lab’s iSCSI Datastore being used to house the imported VM whilst the upload was in progress. So that is the quick walkthrough – nice and simple. 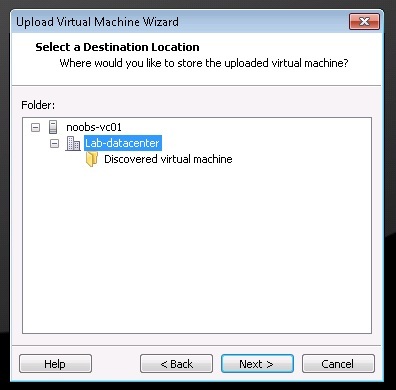 You could save yourself a couple of clicks in the process above by simply dragging and dropping the VM too! Have you tried Workstation 8.0 out yet? What are you primarily using it for? I would also like to know whether VMware will be handing out version 8 licenses to candidates who pass their VCP 5 exams too. I’ll be taking my updating my VCP 4 to 5 soon and would love to have an upgrade to my Workstation 7.0 license! 978 days, 4 hrs and 2 min.